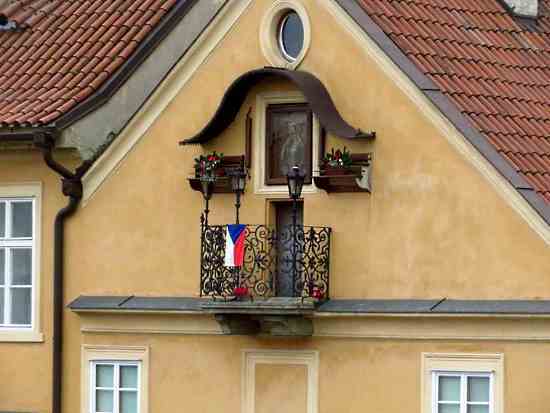 If you cross Charles Bridge, you may notice an odd shrine on the small balcony of one of the buildings on Kampa Island, just a few feet from the bridge. 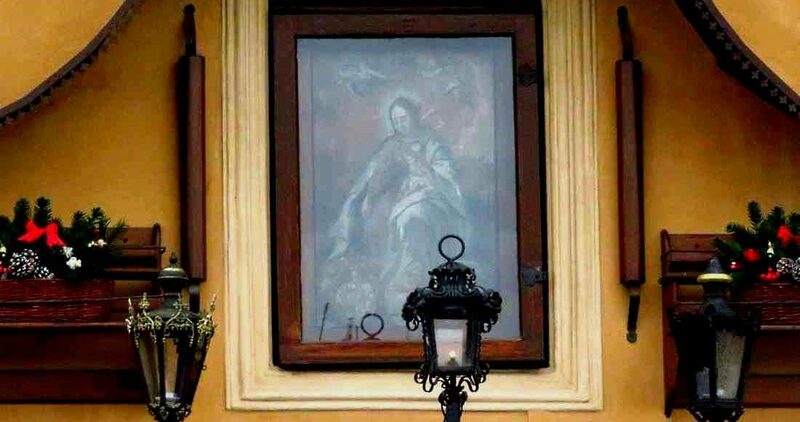 Above the door to the balcony at Na Kampe 514/9 is a faded painting of the Virgin Mary next to two rollers from an old fashioned washing machine. On the metal railing of the balcony there is a lantern with a perpetually burning light. On the sides, there are window boxes of flowers. Few people have ever seen who keeps the light burning, but it almost always is lit. Looking at the shrine involves a bit of risk. The rumor is if you see the candle burn out, then you will soon die. But the candle was long ago replaced with an electric light, so there is not so much of a chance that the wind will blow it out. The balcony is connected to the building’s attic. The story goes that a lonely woman named Petruška lived there. She had few friends and was a bit of a recluse. Instead of talking to people, she spoke to the stars at night, hoping one would come and visit her. But of course, one never did. When she was ill and soon to pass away, she thought again of the stars. She begged for one to visit her. One star told her that she was never alone, as the stars were always with her and appreciated her thoughts. The woman’s soul turned into a point of light and went out to the balcony where it could shine like her friends. It has been there ever since. The painting comes from the flood of 1784. The melting snow from the mountains and rain washing off the fields added to the waters of the Vltava and pushed the river beyond its banks. The house on Kampa is directly next to the river, and its lower levels were flooded. But the person who lived there at the time, František Pelzl, didn’t worry about his own house. He had a small boat and set about helping others. He could see that the devastation upstream was worse than what he was facing. Tangles of farm crops, uprooted orchard trees, and even dead livestock floated down the river and got caught at the piers of the bridge. The water had so much force and the debris created so much pressure that part of the bridge collapsed. Bits of wood and furniture showed that whole houses had been washed away. 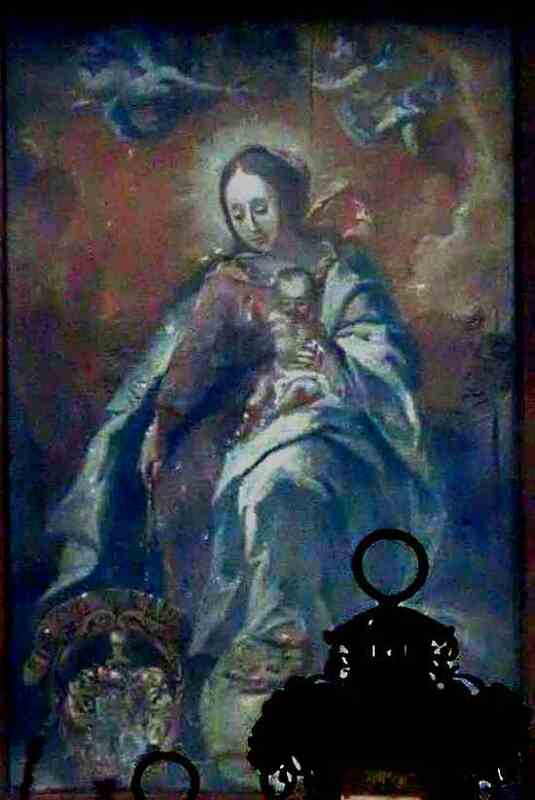 One piece of wall still had a painting attached to it, a framed depiction of the Virgin Mary and infant Jesus, a copy of a painting from 1756. František went out in his boat to save it, as it seemed to him to be a good omen. Once he saved the painting, the flood subsided, and slowly the river returned to normal. He put the painting up outside the tiny attic balcony where the waters could never reach it. Since then his luck got better, and people came to Charles Bridge to stand in front of the house at a high level and ask the miraculous painting for favors. But the story doesn’t end there. The two rollers still haven’t been explained. A young woman named Maria was working in the house doing laundry, which used to be a popular profession by the riverside due to the large supply of water. The laundry was located in the house’s courtyard until 1945. She was wringing out the clothes in an old fashioned washing machine known as a mangler. She got her hand caught in it. This was before the era of personal accident insurance, and these sorts of machines had no safety features, as nobody insisted on installing them. There was no easy way for her to get her hand out. Usually, people who got caught in the machine wound up losing a hand, or getting it mangled as they used to say. She was terrified at the thought. Her mind turned to the painting on the attic balcony. She wished that the icon would protect her hand. Just then the machine snapped open, even though it had no design features to allow for this to happen. Maria pulled her hand out, and it wasn’t even scratched. The rollers from the mangler were placed next to the painting after that. The flower boxes are there just because they are pretty. The shrine at the balcony is a popular with tour guides, and sometimes people can be seen making a wish. The house at Na Kampe 9 has plaques on the riverside facade that show the water level of four floods. 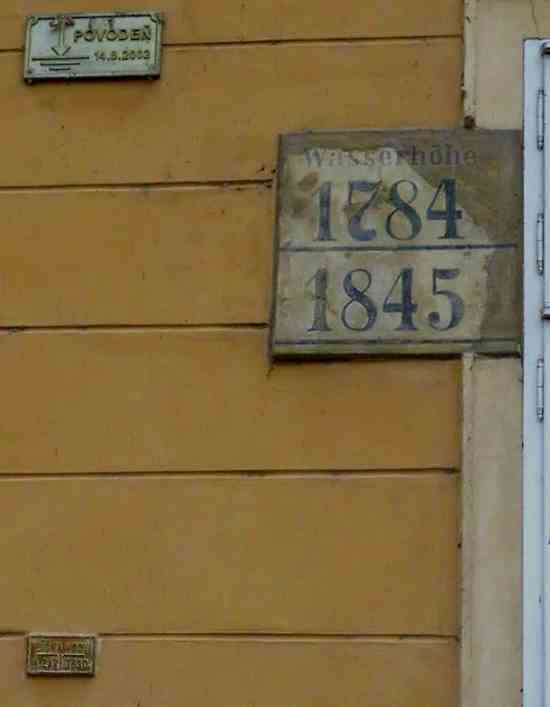 The highest is for 2002, in the middle is a plaque in German for 1784 and 1845, and the lowest is a small green metal one for 1890. Since 2002, the city of Prague has made preparations for floods that include erecting temporary walls. Part of Kampa Island though, including the building with the painting, is not protected as the geography doesn’t permit it to be done easily. 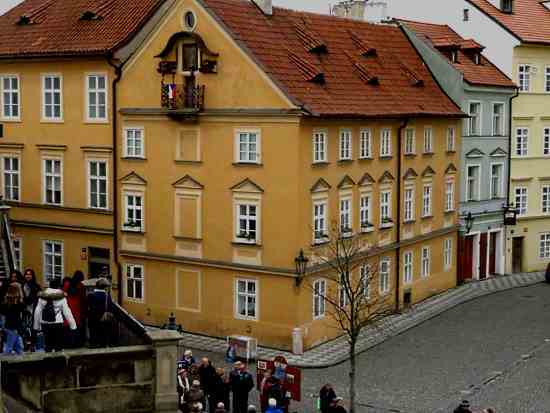 The first mention of the house is in 1657, when Jan Karel and his wife Dorota bought the house, which was severely damaged by the Swedes in the Battle of Charles Bridge. In 1659, it was sold to Jan Jiří Karvínský from Karviná. He began to rebuild and enlarge the house. Signs showing flood levels for 1784, 1845, 1890 and 2002. 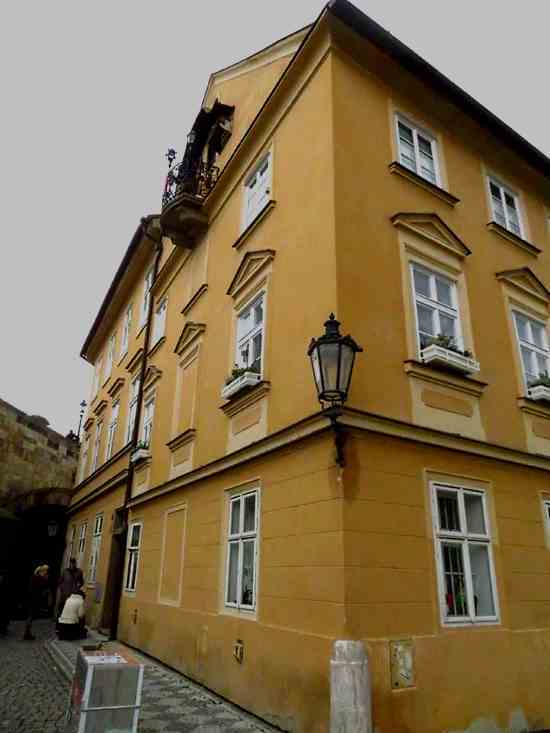 Town officials objected to raising the height of the building so close to Charles Bridge and issued a decree on July 18, 1671, to stop it, but the decree was ignored. The wing with the balcony that has the painting was built sometime after 1769, as street plans before that date do not include it. In 1845-46, the northeast corner and a main staircase were added. In modern times, a shoemaker named Josef Rousek lived at the house from 1898 to 1942 and also ran a boat rental business. He is credited with saving many people from suicide attempts and drowning, as swimming in the river was common although skills were lacking and the river was a lot colder and faster than many people expected. He kept watch over the river from his shoe shop on the ground floor. His family maintained flowers on the balcony and looked after the light. After the Rousek family passed on, a niece took over for more than half a century. She turned over the tradition to a pair of neighbors who still take responsibility for it in the 21st century. 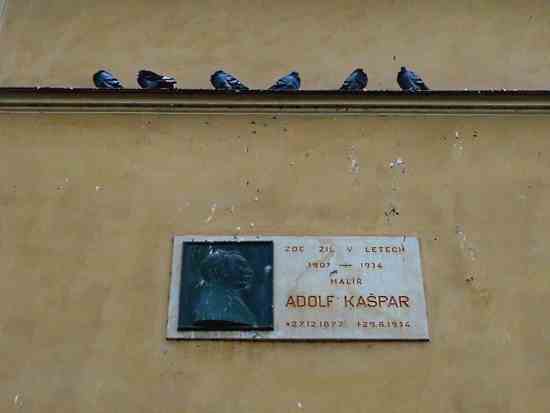 The building also has a plaque for painter Adolf Kašpar, who lived at the house from 1907 to 1934. He became famous by illustrating Božena Němcová’s novel Grandmother (Babička). His illustrations are also in books by Czech authors Alois Jirásek, Jan Neruda, Karel Václav Rais and František Ladislav Čelakovský.